V32-Serene setting backing the meadow - follow the trails to the river! Upgraded chalet with new furniture backing the meadow in quiet Sky Meadows. Just 4.5 miles from the casinos and Heavenly Mountain Resort, and a mile from the lake. You can walk out the back door for a stroll down to the Truckee River or explore the meadow. 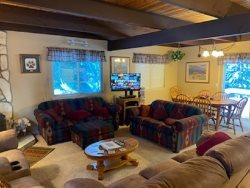 3 bedrooms, 2 baths, fully equipped kitchen, cable TV, DVD, wireless internet access, woodstove, charcoal BBQ, linens provided, no pets and no smoking, HOA does not allow trailers.